Home » Blog » What Makes a Great Pub? What Makes a Great Pub? Hemingway had La Closerie des Lilas Café, his favorite place to write and drink while living in Paris. Orwell provided a detailed description of his ideal public house in “The Moon Under Water.” I may never be the writer both these men were, but they knew what a drinking establishment needed to be great and I think I do too. I do have a favorite watering hole and occasionally I pretend I am seated across from these great men of letters discussing literary concerns, old and new, over a pint. But I wanted to know what it takes to make a great pub (Public House) in Portland from someone who knows Portland and its beer culture. I knew one person that could give me a straight answer. On a recent afternoon, I had the honored privilege to visit with the Beer Goddess, Lisa Morrison, the new business partner of my favorite pub in Portland, the Belmont Station. We discussed what it takes to make a great pub while sipping a fine ale. Lisa expounded that a pub needs to have a community; it needs to be a third place, an environment that is not work or home, but has the welcoming comfort of a home that enables conversation. 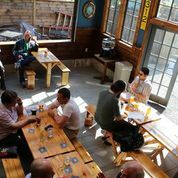 “You can have all the beers, great bar, but that [alone] won’t create a community. You have to have a caring staff, a caring owner,” and an unquantifiable essence that says you are welcome and we are your friends. We both agreed that conversation was essential to any pub’s success. If you can’t talk, then it is not a pub. English pubs, past and present, are the cornerstone of good conversation and where you went to get updated on the community’s events and news. Yes, there was life before Facebook. Similar to a church (without the beer or course), pubs historically were how people met and disseminated information in an informal and comfortable space over pint. As electronic devices sneak their way into more of our lives, I pondered the existence of a television inside a pub. Does a television deter from the sense of a community and connection people have in a pub? Orwell had opinion: “the pub [should be] quiet enough to talk, with the house possessing neither radio nor a piano.” Although TV did not exist at the time Orwell wrote that, I am sure he would have vetoed TV’s place on a wall in any pub. I believe pubs, and all food and drink establishments for that matter, should NEVER have a television and music should be in the background, barely discernible, if at all. Lisa agrees, “A pub cannot have a TV; it is a place to share conversation and ideas and a TV distracts.” I can’t say how I relieved I was to hear her say that. Luckily, the Belmont Station is without such a distraction, and the music is usually low, providing the space to converse with your friends and loved ones. Lisa further explained there was no way she would have become a partner without believing that the Belmont Station provided a community spot for people to connect and enjoy one another like the pubs of England. Lisa wants to facilitate the growth, organically, of the Belmont Station. “I didn’t want to come in with guns blazing,” she offered. Rather, she came in ready to learn from the knowledgeable staff and from customers. She sees it as an already well-established community asset and sees change in small intervals over long periods of time. Cheers to that. 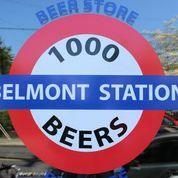 After you kick in your television, visit my favorite pub, the Belmont Station and its fantastic staff, for some conversation and idea sharing. I would also like you to share with me your favorite pub and why it is your home away from home. Let me know at mike@portlandbeer.org or come to the Belmont Station for a pint. I am usually in the back with my wife soaking up the sun.